Laurie Sarkadi is a freelance writer and editor of EDGE YK magazine in Yellowknife. Her memoir about living twenty-five years off-grid in the Northwest Territories is forthcoming. The newly rented campaign office for Dennis Bevington is a cavernous fishbowl of prime retail space—across the street from the post office, butted against the ever-bustling A&W—in downtown Yellowknife’s ailing Centre Square Mall. 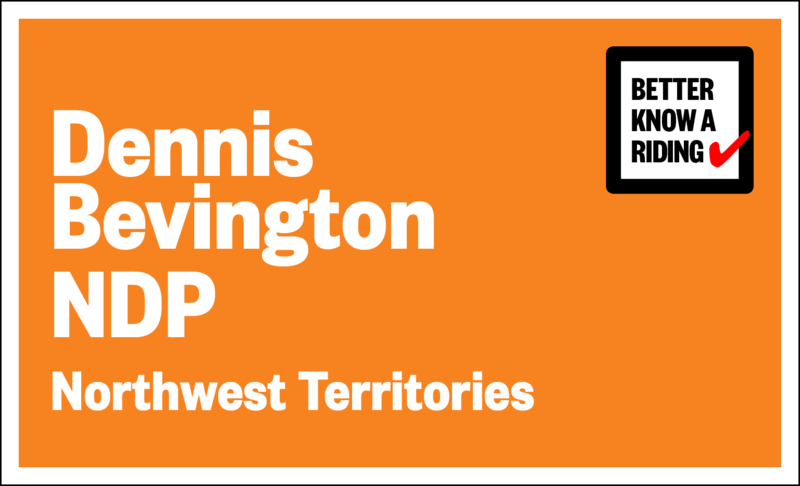 When Bevington’s riding association president, Shane Pike, ambles in with NDP flyers for him to take canvassing, you can almost hear the giant sucking sound of businesses shuttering outside the glass doors. During his three terms in Ottawa, Bevington, a slow-talking, mustachioed MP, has focused on income tax breaks and other ways to lower the cost of living in his Northwest Territories riding, a sprawling, mostly road-less boreal hinterland of more than a million square kilometres that is home to just 43,000 hearty souls, half of whom are Indigenous peoples. Sky-high housing, power, and food prices have made it hard to convince people to set up shop here, the emptying mall an emblem of business struggles across the territory. That the population of the riding, which encompasses the entire territory, is declining means door knocking is essential campaigning. “Yellowknife is almost 50 percent of the vote, so it’s important to go door to door because people are coming and going,” says Bevington as he pins his NDP button upside down to the green sweater under his two-toned leather jacket. His riding association president has taken his backpack and left. There is no staff fanning out to assist the MP—this is the North, nothing ever gets that hectic. So I point out the pin problem before the lanky sixty-two year old sets off at a brisk clip. Almost everyone knows Dennis. In the mall, an Australian former executive of a diamond mine stops him and implores him not to support Yellowknife’s bid for the 2023 Canada Winter Games (Bevington is non-commital). A group of homeless people clustered outside enthusiastically shouts “Heyyyyy NDP” as we walk past on the sidewalk. I’ve been interviewing the former carpenter and mayor of his hometown of Fort Smith since the late ’80s. Unlike Stephen Harper, whose Arctic photo ops touting sovereignty and security have never resonated with northerners, Bevington, with his pocketbook issues and strong environmental stand, has hard-earned appeal here. He is the antithesis of the Conservative’s attempts to facilitate behemoth resource extraction projects by reopening land-claim agreements to weaken the environmental regulatory processes contained within. One Aboriginal government, the Tlicho, is challenging that move in court, and three Yukon First Nations are taking legal steps to block similar actions in that territory. Bevington, in contrast, promotes local, sustainable economies based on small-scale agriculture, fishing, tourism, and alternative power such as solar, wind, and biomass. He’s an expert at the latter, having run a renewable energy company since 1997. But on Saturday, September 5, his mantra at each home he visits is that his nine years in Parliament give him the experience needed to manoeuvre in an anticipated minority government. “I gotta be honest, I haven’t voted NDP,” says the first woman to answer her door in a string of downtown row houses inhabited mainly by federal government employees and their families. “But it’s definitely more than ever a possibility. You’ve done a really good job for the North so it makes it tougher.” As she struggles to keep two large dogs from escaping, she tells him she’s concerned about ISIS, Syria, and the refugees in Europe. “Does the NDP foresee bringing lots of them over here?” the woman asks. Fear creeps onto her face. At the next home another woman is the first, but not last, to ask him why Conservative candidate Floyd Roland and Liberal candidate Michael McLeod—seasoned territorial politicians taking their first stab at Ottawa—have their signs up across the city, while the NDPs’ are nowhere to be seen. On this, and every other point raised in the ensuing ten-minute discussion, ranging from Syrian refugees (she doesn’t want them in Canada) to the roots of al Qaeda, Bevington concludes they must agree to disagree. “It’s big politics and Canada does a great job of trying to balance things, but we’re not doing that anymore,” he tells her. “What we’re doing is taking sides rather than trying to work things out and be a country that can speak to everyone. “No we won’t . . .,” she says. Most of the people in this neighbourhood are newbie northerners in the military and RCMP. It isn’t until we drive down the hill into Yellowknife’s historic Old Town, en route to the adjacent Dene community of Ndilo, that one gets a full sense of Bevington’s popularity in the influential capital, where last election he won 55 percent of the vote. A high school principal hails him down on the street to sign up to volunteer on the campaign. Inside another supporter’s home, Bevington whips out his phone to show off photos of giant cauliflower and fields of potatoes and flax that he took while campaigning through the Deh Cho region, camping in his Chevy Colorado with his wife Joan. He says he will reach all thirty-three communities in the territory before the election, by driving his truck to those that are road-accessible and taking scheduled airline flights to the rest.